I've been thinking about children's board games ever since I read Chris Dahlen favorably compare Chutes n' Ladders to Fracture last fall. And then this week, I read a piece over on Boingboing in which Stephen Johnson (writer of the essential Everything Bad is Good for You) tore Candyland a new one. (A sampling: “what sort of message does Candy Land send to our kids? ... It says you are powerless, that your destiny is entirely determined by the luck of the draw, that the only chance you have of winning the game lies in following the rules, and accepting the cards as they come. Who wants to grow up in that kind of universe?”) The fascinating thing is that there's this whole battery of games-- Battleship, War, 7 up, Puppy Pals Bingo-- which defy all my basic assumptions about what makes games compelling. And since Charles Pratt encourages us game-critic-types to understand all different kinds of games, it seems worthwhile to figure out the mystery of Candyland. This all seems wrong to me. Sid Meier purportedly described a video game as a series of interesting decisions, and while this isn't perfect it certainly squares with my sense of things: games are interesting because they provide this tightly governed space where your decisions and skills and apprehension of the rules determine whether things go right or not. It's this making-things-go-right-through-skills that make your triumph over your little brother at NHL '94 worthwhile. This conquest would ring hollow if it all hung on chance. And we hate the video games when they punish you with arbitrary obstacles – ninjas hitting us with exploding arrows from offscreen, and the like. It offends our sense of propriety. Our sense is that for once in our lives, we should be spared outrageous fortune for a few hours. Gambling may help to further clarify things. Casinos have all sorts of games that are as senselessly random as kids' games-- Keno, Slots, Roulette, and the like. It's the riding-of-money-on-things that makes these games interesting. Nobody would play Roulette unless there was some action to be had Since your success or failure is a matter of pure luck you need to get some cash involved in order to gin up some interest in the proceedings. We can all agree that Candyland would be sweet if there was some cash at stake, but that's regrettably not the case. So what's the appeal? My ladyfriend told me I'm overthinking this: “you don't need any complicated concept at the center of Candyland, because you're in a magical land made out of candy.” This point is well-taken: there are pictures of candy involved. Maybe Battleship scratches your itch when it comes to your fantasies of nautical warfare; I had Electronic Talking Battleship growing up, and it added a lot in the atmospherics department. Also, there's a way that these games create drama out of uncertainly. While you can't control your destiny in Chutes n' Ladders, its rules create all these late-minute reversals and dramatic tension. There's an appeal to the mere sense of tension, this am I gonna make it to the end feeling. It's exciting, especially if you are four and the status of victor is new to you. A lot of great games like Monopoly or Catan have this element of fortune in them because they hang on dice rolls. Maybe these games are a more faithful representation of real life, because success is a liberal mixture of planning and luck. But in the end what I'm led to think is that Candyland is fun because it's a game about mere rule-following. As Johnson says, “winning the game lies in following the rules;” and though he means this as a knock I think it's the reason we like these games. Moreso than winning, the big accomplishment in Canyland is just correctly playing the game. Following the rules is the only skill the game requires. It has to be that following rules is fun. In itself. Why is it that we would follow rules for recreation? It sounds all wrong, horrifically un-fun, to say that we like rules. Well, my hunch is that it's because human beings are rule-mongering creatures. Other animals know how to do all their essential life-tasks on instinct; a spider doesn't need to learn to spin it's web. But in order to accomplish our higher-order tasks-- assemble our Ikea furniture, sow crops, apply for a car loan-- us sapiens need to learn how to follow procedures, grasp abstract rules, understand patterns. These native talents are our meager dispensation from nature. As Kant says, the natural world acts according to rules but humans act according to the conception of rules. Candyland is a kind of dry run. In Everything Bad is Good for You, Johnson proposed that this basic human lust for rules was built into our psychology by evolutionary pressures. This is why we like video games-- we're hardwired to take enjoyment in discovering the rules latent in the systems we confront. And though evolutionary neuroscience is a tenuous enterprise at this point, I've always thought he's onto something. The whole edifice of human civilization rests on our malleability, our capacity to mold our conduct in accord with rules. Sometimes this conformity is voluntary; sometimes not. The redeeming thing about games, these little artificial sets of rules we construct for ourselves, is that they present this one space where this conformity is a matter of choice, rather than necessity. Image courtesy of the marvellous bead artist Peggy Deciember. I don't think it's fair to say that battleship involves no skill. Over a series of games with the same opponent there's a kind of metagame that can develop which is about figuring out how your opponent is going place their ships based on where they have done so in the past. A computer opponent could place their ships randomly every time, but it's tough for a person to do so. There is absolutely pleasure in learning then mastering any new system of rules, learning to manipulate blocks in Tetris until doing so becomes second nature or learning to throw a frisbee straight and far. I claim that there is even more pleasure in achieving a goal of that system of rules, be it clearing a four line Tetris or scoring an ultimate frisbee goal. Recently, in Sid Meier’s Pirates, I recently felt a considerable, irrational pleasure when capturing a Ship of the Line. By mastering and persistently laboring within the framework of Pirates and, importantly, anticipating my goal, I was primed for the pleasure of owning that mighty warship. Regarding the pleasure of playing both Candyland and chess, I claim that both ping the same anticipation/pleasure-reward circuits albeit with a different gaming model, the enjoyment of which is a matter of taste and mood. Some persons prefer a meticulous, exact form of thought. A total information game like chess offers them the most amenable form of goal-seeking and reward. Others, like myself, are natural optimizers for whom a probabilistic, optimization game like Catan is best. (Aside: these second sort of games benefits most from Meier’s interesting decisions. Second aside: in controlled doses, I have recently found that trading stocks offers the same pleasures as a good Catan match.) Finally, some prefer gaming to be purely probabilistic, like Candyland or slot machines. The rewards are now spread at random in the deck on the board. Yet, I claim that the emotions/physiological effect of goal-reaching are the same in Candyland as those in any game with player agency. juv3nal: I'm with you on Battleship not being random. I once heard Plisken claim that winning "rock, paper, scissors" was always based on pure luck, challenged him to a round of said game, and proceeded to beat him 16 times in a row. To this day he has never beaten me at rock paper scissors, precisely because he fails to attend to the psychological element. Just like the inventor of rock paper scissors failed to attend to marketing: it should have been called "CandyWar!" I think you're overthinking Candyland -- it's not fun for adults, and it's not meant to be. It's a toy that teaches small children everything about games except strategy (unless you count cheating as a strategy! ): cooperation with opponents, acceptance of ad hoc rules, etc. I'd take the "right" out of "making-things-go-right-through-skills" too, as games are thankfully starting to branch out and not be stuck in the punitive, right-or-wrong mode of construction. Also, this was the first post of yours I've read which seemed disorganized and confused. At one point you purport that following rules is fun, and later on you suggest that discovering rules is fun. These are not the same, and I would argue strongly against the former. Rule-following gives us a measure of trust and cooperation, allowing us to take basic, immediate concerns (e.g. physical safety and linguistic communication) for granted in order to plan for more complex or future concerns -- but that doesn't mean that the benefits of such adherence constitute fun. I would, however, completely back you up on the rule-discovery front. In the real world we know there are rules, and we know that we will fare better by comprehending, mastering, and sometimes exploiting those rules than by flailing about in ignorance. Moreover, we know that we may be able to transfer skills or knowledge between rulesets, or at the very least that learning the ruleset of one environment improves our ability to break down a different environment into its constituent rules. Therefore, it stands to reason that voluntary engagement (as you said, "a matter of choice rather than necessity") in low-risk rule-mastery challenges should trigger a reward sensation like "fun". The pleasure of mastering rule systems is what makes nomic games so exciting and what gives Calvinball its irresistable allure. Rule discovery is to humans what play-fighting is to animals. Fighting as a front-line soldier in an actual war isn't fun, but when the immediate concerns -- involuntary involvement and high risk of death or injury -- are mitigated, mastering the same set of rules can instead become a fun challenge. Our brains encourage us to take small risks in order to handle future risks better. @juv3nal: see the link mr. cyranix provides below, as well as the commentary from "anon." while I must admit that I find Battleship the boring-est game of all time, you're probably right that insight into human psychology deprives the game of sheer randomness. @ramshot: a provocative thesis as always, mr. Croton. I am unsure about the neuroscientifical soundness of the anticipation/reward mechanism, but i think the hypothesis would help explain why we take such interest in games whose outcome is entirely random. The capacity to set goals and realize them is certainly an essential and possibly adaptive segment of the human endowment. Nevertheless I think that the pure-chance games (slots and candyland) are a special case: there's a reason that these games appeal to gamblers and children exclusively. Our sense of earned success must factor into things, somehow. As you rightly note, it's essential to keep these sorts of games separate, particularly since (from the perspective of video games crit) the last category is so ubiquitous and important. As I said, the fun-ness of category one is something of a puzzle to me, and my hunch is that its enjoyment is parasitic on that of category three. That is, it's gratifying because it's a proto-version of game-type-three. Certainly, applying for a bank loan isn't fun, but my sense is that the enjoyment of structured activity is a crucial component of our adolescence. I hope this clarifies my intentions in the piece; at any rate, I want to thank you for keeping me honest and also thank you for you probing contribution here. (I'm going to marinate on the point you made about narrative, it's very provocative.) Props to you also for the Calvinball reference. Thank you for your clarifications. I'm definitely interested in hearing more about your distinction between rule-following games with decisions and rule-discovery games. I believe that these two types might be better represented as ends of a gradient, or perhaps even two ways of looking at the same phenomenon, because of the way that strategy interacts with rules. As for Candyland, I'd still contend that it's a toy that begins to teach children about games. If there's a source of fun in the game, my guess would be that it stems from an even more rudimentary kind of learning: not that of covert rules but of simply converting the unknown into the known. With surprises, pure-luck gambling, and Candyland, we become the agents of chance -- nothing happens if we don't act, but something can happen if we do act, and that surely is a basic source of empowerment and enjoyment. Hm, I should have proofread before posting. (Bad habit of mine!) I don't think I sufficiently addressed the way that overt/covert interacts with guaranteed/probabilistic. Certainly the Zelda games have rules that are covert but, once discovered, immutable. I can only hope that my previous comment provides you with food for thought. Heh, reminds me of Brenda Braithwaite's rant about Monopoly being an illusory evolution of Candyland. You incorporate an element of choice into the game that is completely arbitrary and whose benefits are still governed totally by chance. If you want to try a board game that goes over well with older folks, 'Apples to Apples' takes the exact same concept of Candyland and just uses the human psyche for dice. You collect 7 tokens to win. Tokens are awarded based on a player's judgment over which card represents a topic chosen best. Rather than have it be a dice roll to determine who wins, it's just the random fickle of someone's subconscious. Speaking as a gamer father with three kids, I don't think that Candyland teaches anything bad because, at the ages that kids enjoy it, they are not old enough to tell the difference. They don't know that they are not making decisions, and they are not old enough to value decision making as a morally superior way to win. When they get old enough to tell the difference, they universally reject the game. Candyland allows kids to enter a world and experience triumph and pathos in the process of accomplishing something. At a deeper level, this might have something to do with learning rules, but I don't think that it gets at their experience of playing the game. The kids feel like they are really doing it and they feel correspondingly proud if they win or frustrated when they lose. The type of person that becomes a serious gamer is the type of person that loves figuring out rules. Most people, let alone most kids, don't think that way. When gamers toss around ideas about kids' motivations, they are more likely to come up with sublimations of their own motivations rather than explanations for why most young kids love Candyland. I recommend that you watch real kids play Candyland. As an adult, it's a baffling experience because the game appears futile and frustrating. For example, my kids play games in ways that are completely baffling. In Mario Kart, they take turns winning, driving in such a way to ensure that each person gets to win in first, second, and third an equal number of times. As an adult, this type of play is exceedingly tedious and I cannot do it. A single kid will often plug in all of the controllers to a multiplayer game, and then control each of the players to accomplish their own set of objectives. Again, this doesn't make sense to me. It's possible that my kids have their own obscure methods of play and that this taints my perspective, but I don't think that your theories about rules get at the core of kid motivation. In short, I think that your ladyfriend has it more correct. @cyranix: I think that the distinction you're making here is between mere rule-following and rule-mastery. The covert rules are these procedures-- strategies, or general policies-- that let you create the best outcome given the rules. And I think you're right that coming up procedures of this sort is essential to what makes these strategy-type games enjoyable. @L.B. Apples to apples is the best. It actually reminds me of Risk a little bit, because Risk is really a game about diplomacy as much as it's a game about strategy. @Karl: this is a really good point. I think it's actually really interesting that kids often take these rule-structured games and invent their own rules for them. Much more than adults, it seems like kids enjoy trying out these little games they invent for themselves regardless of how coherent they are from an adult perspective. Maybe this means I should just wait until I have some test subjects before I venture any more theories about child psychology. Maybe I overdid it. I wasn't trying to disqualify your point altogether. I think that rules are critical to games because rules are the way that the game world is constructed. That said, I think that people play games for all sorts of reasons and, especially for young kids, their motivations may or may not be similar to ours. Kids that are on their way to becoming gamers probably do like trying to figure out the rules, but less competitive kids might experience it differently. While this may very well be the kind of "When gamers toss around ideas about kids' motivations, they are more likely to come up with sublimations of their own motivations" that Karl was talking about, reflection on my own experience playing candyland suggests that its lack of complicated rules was an attraction. I didn't have to get all stressed out about remembering the rules, so I could instead focus on what was the best part of candyland for me: imagining I was in candyland! Come on, you are on a bridge made of gum drops, that is awesome! I think candyland would not be a tenth as enjoyable for a little kid if it was exactly the same rules but printed on black and white with locations like "location alpha" and characters like "noam chomsky." 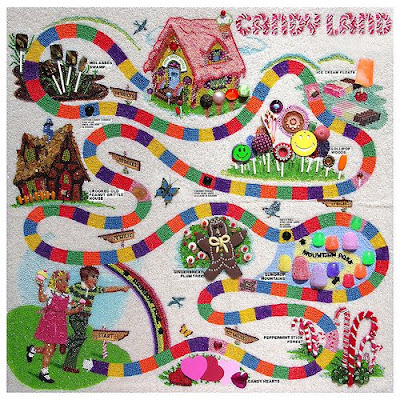 The arbitrariness of action - result correspondences in candyland is like an automation of the rules. I'm not worried about how or why I am sent back to the gumdrop bridge, so I can enjoy imagining eating gumdrops, and hope that my next card will result in me eating imaginary lollipops! Also, this comment is so much bs. HAHAH! Which, I was not surprised to find, actually says very little about the psychological relationship between dopamine binding and game play, and is really mostly about the method they used to visualize dopamine binding. Loosely, it does seem to support the thesis that increased striatal dopamine binding does occur during video games with clear objectives, but that's almost so uninteresting it wasn't even worth doing (which is probably why there is only one paper.) I think it does not even begin to get at the much more sophisticated issues being raised in this thread. --It's hard to get at dopamine usage in humans. What you'd really need to understand the role of dopamine circuits in gaming behavior would be an animal model (because you can sacrifice rats and look at their brains, but you can't do that with humans), but it is hard to teach rodents how to even play candyland, let alone cattan. HA! --Probably the reason that that study I cited got published in the first place was for demonstrating a method for visualizing dopamine usage in humans in vivo. That's also probably why the technique, and not psychological interpretation, is such a focus of the paper. I am really impressed with your writing skills as well as with the format to your blog. Is this a paid topic or did you modify it yourself? Either way keep up the excellent high quality writing, it is rare to peer a nice weblog like this one these days..